Men and women remain unequal in the United States, but in this provocative book, Robert Max Jackson demonstrates that gender inequality is irrevocably crumbling. Destined for Equality, the first integrated analysis of gender inequality’s modern decline, tells the story of that progressive movement toward equality over the past two centuries in America, showing that women’s status has risen consistently and continuously. Jackson asserts that women’s rising status has been due largely to the emergence of modern political and economic organizations, which have transformed institutional priorities concerning gender. 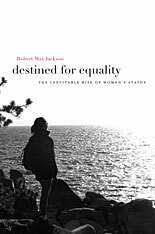 Although individual politicians and businessmen generally believed women should remain in their traditional roles, Jackson shows that it was simply not in the interests of modern enterprise and government to foster inequality. The search for profits, votes, organizational rationality, and stability all favored a gender-neutral approach that improved women’s status. The inherent gender impartiality of organizational interests won out over the prejudiced preferences of the men who ran them. As economic power migrated into large-scale organizations inherently indifferent to gender distinctions, the patriarchal model lost its social and cultural sway, and women’s continual efforts to rise in the world became steadily more successful. Total gender equality will eventually prevail; the only questions remaining are what it will look like, and how and when it will arrive.